People all over the world economy are in "vulnerable" jobs, which the International Labor Organization defines as "own-account work and contributing family employment"--that is, you're working for yourself or for your family, rather than for an employer. 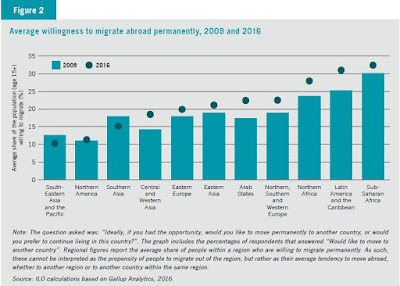 Not surprisingly, the desire to emigrate is high in many parts of the world, and seems to be on the rise. Here are two figures from the World Employment and Social Outlook: Trends 2017, published in January 2017 by the International Labour Organization. For starters, here's a figure showing some employment patterns across the world. The first panel shows that the official unemployment rate doesn't look all that dramatically different across developed, emerging, and developing economies. 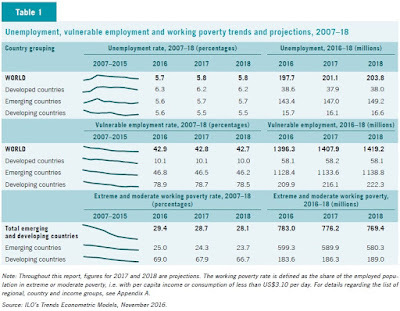 The big difference is the "vulnerable" employment rate, which is about 10% in developed economies, nearly half the workforce in emerging markets, and more than three-quarters of the workforce in developing countries. As ILO notes, "these workers have less access to social dialogue and are less likely to exhibit job security, regular incomes and access to social protection than their wage and salaried counterparts." The bottom panel shows the share of workers living in extreme or moderate poverty, which is defines as iving on less than US$3.10 per day. In emerging countries, this is nearly one-quarter of all workers; in developing countries, it's about two-thirds of all workers. It's no surprise that many people who are staring these economic prospects in the face would be willing to relocate to another country. The bars and dots show the share of people in each region who answer that they would like to move to another country, in answer to the question: “Ideally, if you had the opportunity, would you like to move permanently to another country, or would you prefer to continue living in this country?” The bars are for the year 2009; the dots are for 2016. 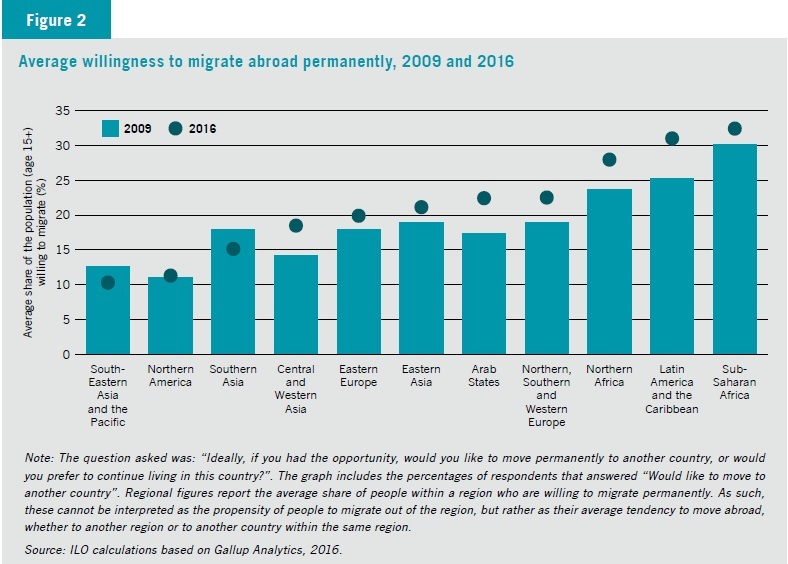 Thus, for regions of the world other than North America, Southern Asia, and Southeastern Asia, share of people who would be willing to move if they had a chance is typically more than 15-20%. One of the most striking and troubling patterns in the US economy in recent decades is the "declining labor share: that is, the pattern that the share of the value of output (in the nonfarm business sector) that goes to workers in the form of compensation, which includes benefits as well as wage and salary compensation, has been dropping. The labor share was typically in the range of 63-65% from the 1950s into the early 1970s. By the 1980s and 1990s, it was more often falling in the range of 61-63%. In the early 2000s, it fell below 60%, and since the end of the Great Recession in 2009 it has typically been between 56-58%. This falling labor share is not some statistic recently created and promoted by partisan sources. It's calculated by the US Bureau of Labor Statistics, using a methodology that has remained more-or-less standard over the years. Two economists at the BLS, Michael D. Giandrea and Shawn A. Sprague, explain "Estimating the Labor Share" along with an overview of research findings on the issue in the February 2017 issue of the Monthly Labor Review. There seems to be a slow decline in the labor share from the 1960s though the 1990s, which is briefly interrupted by a dot-com bounce at the 1990s, and then turns into a faster decline in the early 2000s. This pattern is part of what lies behind some other much-discussed changes in the US economy. For example, average wage increases have not matched up average productivity gains in recent decades, which is because the share going to labor is declining. A smaller labor share also has implications for the distribution of overall income, because it implies that those who receive a greater share of their income from non-labor sources, like returns on investment, are going to do relatively well. Cheaper investment goods, like computers, are leading firms to use more capital and less labor, which reduced the labor share. For example, the authors write: "Karabarbounis and Neiman examined data from more than 50 countries and argue that the decline in the relative price of investment goods—in particular, computerized capital—has led firms to employ more capital and relatively less labor. They find that this shift has been responsible for approximately one-half of the observed decline in the labor share." A related version of this theory is that while some new technologies should be viewed as substituting for labor, many other should be viewed as augmenting the productive power of labor. As the authors describe it: "Lawrence writes that increases in labor-augmenting technical changes essentially increase the amount of labor provided by a given number of workers, thereby decreasing labor’s share of output." The underlying assumptions about "proprietor income" are biasing the labor share calculations. The calculation of labor share involve adding compensation received by employees to "proprietor income," which is the labor income received by those who run their own business. However, proprietor income is conceptually tough to measure, because someone who owns their own business can receive both "labor income," as if the person was an employee of their own business, and "capital income," as the owner of the business. In the real world, these two types of payments are jumbled together. To address this issue, the Bureau of Labor Statistics has assumed that the hourly labor compensation of proprietors is the same as that of employees. However, if the labor income of proprietors is actually rising over time, then this assumption means that the labor share is understated. One study finds that about one-third of the observed decline in labor share is due to this assumption that the hourly labor compensation of proprietors is the same as that of employees, rather than using an alternative method that tries to estimate the capital income of proprietors directly. Increased imports of labor-intensive goods. A rise in imports of more labor-intensive goods means that production in the US economy will tend to be focused on less labor-intensive goods, which should tend to drive down the labor share. Teh authors cite work by Elsby, Hobijn, and Şahin concerning "an increased reliance on imported inputs used in domestic production, especially inputs that have labor-intensive production processes. These `offshored' inputs are typically produced in countries with lower labor costs, resulting in an overall reduction in the price of domestically produced final goods." Different industries have different labor shares, so shifts in which industries are larger or smaller can affect labor share. The authors write: "Declines in durable goods manufacturing and nondurable goods manufacturing were responsible for 2.8 percentage points and 1.6 percentage points, respectively, of the decline in the overall labor share. 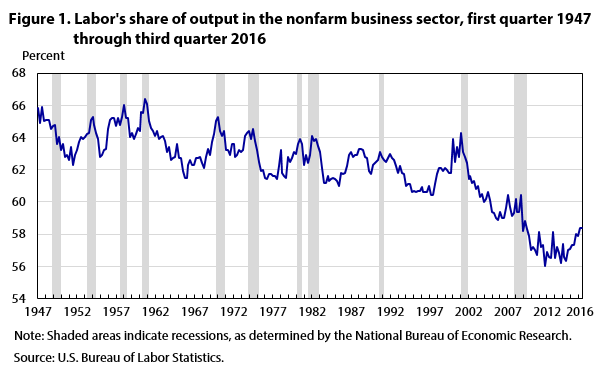 Over the same period, several industries showed gains in their labor share—led by professional and business services, which contributed 2.5 percentage points, partially offsetting the decline in the overall labor share. These explanations all have some plausibility, but it isn't clear to me that, taken together, they adequately explain the fall of more than four percentage points in labor share in the decade or so from the early 2000s (roughly 61%) to the years right after the Great Recession (just above 56%). The labor share does show some sign of rebounding in the last couple of year, and it will be interesting to see whether that turns out to be true bounce-back or a damp squib. There is reason to be dubious, at least in theory, about how kidnap insurance can work. After all, buying kidnap insurance only makes sense if you believe that, in the case of being kidnapped, it will increase your chance of being released. After all, if kidnappers know (or can figure out) that certain people have kidnap insurance, won't they tend to target such people? Also, if a kidnap victim has insurance has insurance, won't the kidnappers demand the monetary equivalent of the earth, moon, and stars as a ransom? In these ways, might the presence of kidnap insurance increase the amount of kidnapping? On the other side, insurance companies have a profit motive to take actions that would reduce the number of kidnappings and the size of ransom payments. But if kidnappers make extraordinarily high demands and the insurance company pushes back, then it seems likely that negotiations over ransom will tend to break down--in which case the rationale for buying kidnap insurance in the first place would disappear. And how can kidnap insurance companies figure out a way to deal with the situation of kidnap victims who don't have insurance: if the representatives of those victims (who may in some cases be national governments) pay high ransoms, then it will be harder for the companies that sell kidnap insurance to keep other ransom demands down. All kidnap insurance is underwritten or reinsured at Lloyd's. By setting clear parameters for commercial resolution, Lloyd's enables “fair” competition between different providers and avoids kidnap insurance being sold monopolistically. There is a protocol for insuring and resolving kidnaps, which emerged from the members themselves. Its use is mandatory and it (largely) prevents individual insurers from conferring externalities to the rest of the sector. The insurance market works smoothly because Lloyd's enables relevant case information to flow easily between insurers without compromising client confidentiality. Underwriters constantly interact with each other and individuals who do not pass (truthful) information to the Lloyd's insurance community or spread it beyond its confines can be ostracized. The owner-manager of a Mexican company is abducted at gunpoint. A ransom of US$1 million is demanded with a threat of mutilating the hostage. His kidnap for ransom insurance is activated. A crisis response consultant coordinates a crisis management team with the hostage's brother as the only point of contact with the kidnappers. The consultant advises that previous cases in this area have settled for around US$100,000 and that “we have yet to actually receive an ear….” The brother makes an initial cash offer of US$40,000 citing liquidity problems at the firm. This is progressively raised, but in decreasing increments. After 16 days the wife tearfully pawns her engagement and wedding rings to bring the total offer to US$99,814. The kidnappers accept, the crisis responder manages the ransom drop, and the hostage is safely released. An aid worker is kidnapped in Yemen. Unbeknownst to the family, the NGO's strategic risk management plan includes kidnap for ransom insurance. Within 24 hr, a crisis response specialist convenes a crisis management team of senior staff to conduct the negotiation with the kidnappers. He personally assures the family that “… everything will be done to ensure the timely and safe return of the hostage.” The NGO is advised to negotiate, but to stall and reject the ransom demand of US$500,000. A former SAS officer bases himself in war-torn Aden to open indirect negotiations with tribal elders. After 36 days, the local sheik indicates that the hostage could be released in exchange for a new generator for his village. The NGO agrees, the unharmed hostage is released, and the NGO operates undisturbed afterward. If you are teaching about insurance markets and need to spruce up your classroom with a fresh and vivid example of adverse selection, moral hazard, and potential spillovers, this topic and very readable article could be a useful resource. Across OECD countries, a significant share of health care system spending and activities are wasteful at best, and harm our health at worst. One in ten patients in OECD countries is unnecessarily harmed at the point of care. More than 10% of hospital expenditure is spent on correcting preventable medical mistakes or infections that people catch in hospitals. One in three babies is delivered by caesarean section, whereas medical indications suggest that C-section rates should be 15% at most. Meanwhile, the market penetration of generic pharmaceuticals – drugs with effects equivalent to those of branded products but typically sold at lower prices – ranges between 10-80% across OECD countries. And a third of OECD citizens consider the health sector to be corrupt or even extremely corrupt. At a time when public budgets are under pressure worldwide, it is alarming that around one-fifth of health expenditure makes no or minimal contribution to good health outcomes. ... Actions to tackle waste are needed in the delivery of care, in the management of health services, and in the governance of health care systems. There's no magic bullet for reducing wasteful spending: instead, the strategy of the report is to pile up studies and examples until the sheer weight and number of opportunities to reduce health care spending is overwhelming. The report divides the evidence into three main categories: wasteful clinical care (care that either provides very low value or can even be counterproductive to health); operational waste (like paying excessively high prices or overusing expensive inputs like brand-name drugs); and governance-related waste (like ineffective or unnecessary administrative expenses). Here are a few words on each. Antibiotics for upper respiratory tract infection. Dual energy X-ray absorptiometry (used to measure bone mineral density). Preoperative testing in low-risk patients (electrocardiography, stress electrocardiography, chest radiography). Artificial nutrition in patients with advanced dementia or advanced cancer. Proton pump inhibitors in gastro-oesophageal reflux disease. Cardiac imaging in low-risk patients. Cancer screening (cervical smear test, CA-125 antigen for ovarian cancer, prostate-specific antigen screening, mammography). A recent report suggesting that medical errors might be the third cause of death in the United States starkly calls attention to the problem (Makary and Daniel, 2016). 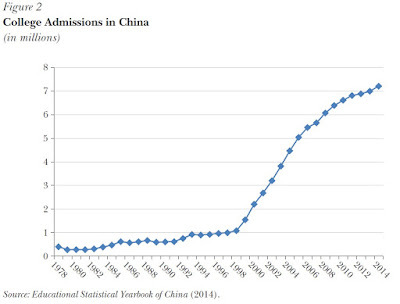 International studies indicate that adverse events in hospitals add between 13% an 16% to hospital costs (Jackson, 2009) and that between 28% and 72% of them are considered avoidable upon expert examination (Brennan et al., 1991; Rafter et al., 2016, among others). Data on primary care are scarce, but the Primary Care International Study of Medical Errors showed that approximately 80% of errors could be classified as “process errors”, the vast majority of which are potentially remediable (Makeham et al., 2002). The idea that errors committed by US health care providers might be the proximate cause of death for tens of thousands or even several hundred thousand people each year may seem extreme, and it is often fiercely contested by health care providers, but it is a common finding in this literature. The study they cite is from Martin A. Makary and Michael Daniel, "Medical error—the third leading cause of death in the US," BMJ 2016, 353, i2139. For a review of some earlier evidence, see my post on "How Many Deaths from Mistakes in US Health Care?" (November 12, 2015). It starts with a discussion of perhaps the most intuitive case of waste, which occurs when prescribed pharmaceuticals (and other medical goods) are discarded unused. Next, the chapter proceeds to the foregone opportunities associated with not substituting originator drugs with cheaper therapeutic alternatives, such as generics or biosimilars. The final issue explored is whether lower prices for pharmaceuticals and other medical supplies could be obtained with more efficient procurement processes. 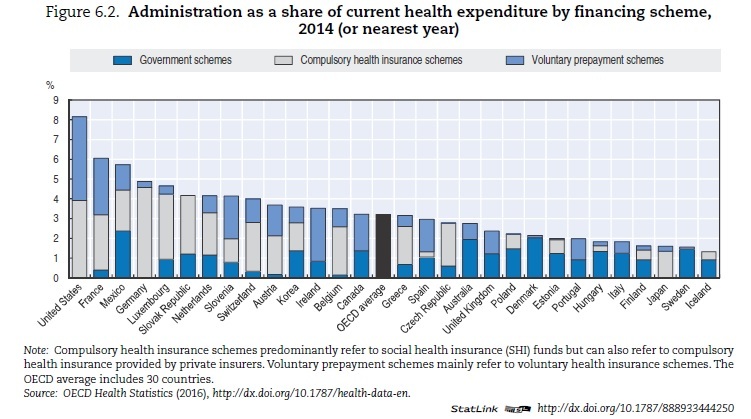 In the general area of governance-related waste, the essay on "Administrative spending in OECD health care systems: Where is the fat and can it be trimmed?" by Michael Mueller, Luc Hagenaars and David Morgan, includes this interesting figure comparing administrative costs across countries. The right-hand figure is a comparison of administrative costs in government health insurance programs, while the left-hand side is voluntary private health insurance programs. 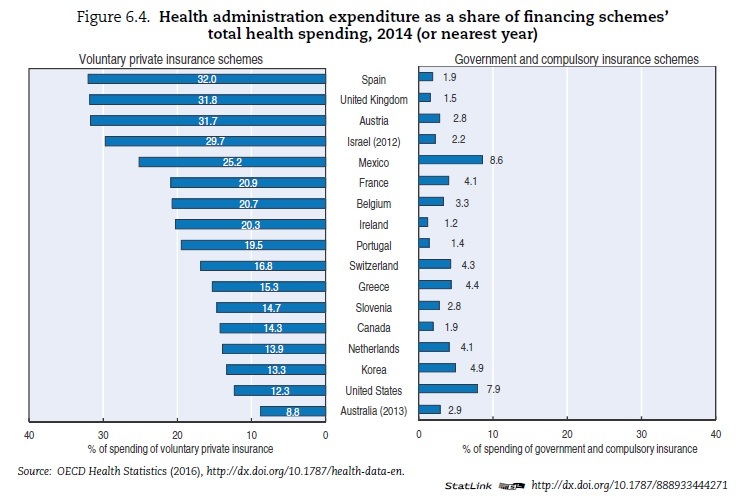 The tricky part of interpreting this figure is that administrative costs play a bigger role in private sector health insurance, and the the US has much more of its health insurance in the private sector than other countries. So if you put these together, it turns out that the US administrative expenses related to health insurance are substantially larger than in other countries. It would of course be foolish to argue that all administrative costs are wasteful, and the report is far too sharp to make such a claim. 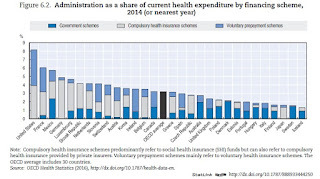 But it is fair to say that one of the costs in the way that the US has chosen to organize its health care sector is higher administrative costs. And of course, the answer to high administrative costs often seems to be hiring another set of administrators to oversee utilization, promulgate rules for provision of care, double-check payments, and so on. In many cases, decisions about what medical care to receive and how to deliver that care fall into a gray area. It's often not 100% clear whether a certain procedure was needed, or not needed; not 100% clear that an error was made, or whether a reasonable judgment call was made; or whether a certain administrative act is wasteful, or whether it is reasonable oversight that reduces the risk of poor care and holds down costs. But the report makes a persuasive case that a substantial share of health care spending, not just in the US but in all advanced economies, is not doing much to improve health. "The high contribution of the agricultural sector to GDP also underlines the limited diversification of most African economies. 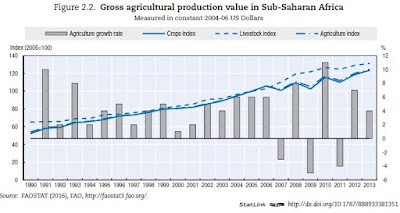 On average, agriculture contributes 15% of total GDP, however it ranges from below 3% in Botswana and South Africa to more than 50% in Chad ... Agriculture employs more than half of the total labour force and within the rural population, provides a livelihood for multitudes of small-scale producers. Smallholder farms constitute approximately 80% of all farms in SSA and employ about 175 million people directly. ... [R]ecent surveys suggest that agriculture is also the primary source of livelihood for 10% to 25% of urban households." However, "[p]roduction growth in SSA has failed to keep pace with demand deriving from population and income growth, resulting in rising imports for food commodities such as wheat, rice and poultry. In many instances, import tariffs have been employed to support domestic producers, particularly relative to other producers outside the region." 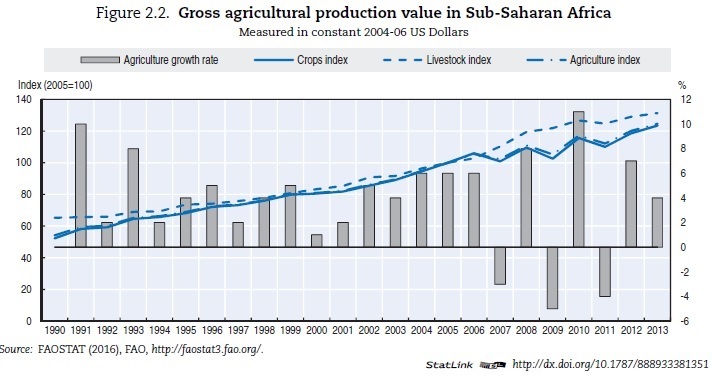 In the past, output growth in African agriculture has tended to be driven by more land and more intense cropping, not by improvements in productivity or mechanisation. "The African model of agricultural growth differed significantly from that of Asia or South America. In Asia, growth was driven largely by intensification, whereas in South America, it was the result of significant improvement in labour productivity arising from mechanisation. 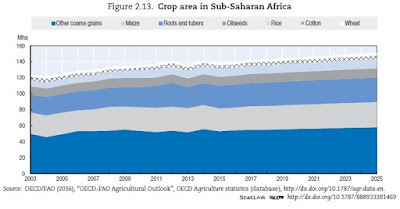 By contrast, strong growth in SSA agricultural output has accrued predominantly from area expansion and intensification of cropping systems, as opposed to large-scale improvement in productivity. ,,, [P]roductivity per agricultural worker has improved by a factor of only 1.6 in Africa over the past 30 years, compared to 2.5 in Asia." However, future major expansions in agricultural land seem unlikely. "Much of the underutilised land is concentrated in relatively few countries and between one half and two thirds of surplus land is currently under forest cover. Conversion of such forest land to agriculture would come at considerable environmental cost." Thus, the projections for the next decade show only modest rise in agricultural land. More intensive cropping on that land has natural limits, too. What are some of the main priorities that could help African agriculture to evolve in the direction of higher productivity and higher value-added? "Arguably the greatest challenge facing the agricultural sector in SSA is weak infrastructure including transportation networks, access to energy, irrigation systems and stockholding facilities. Poor transportation networks limit access to markets, often exacerbate high levels of post-harvest losses and also inhibit efficient distribution of inputs such as seed and fertiliser. At the same time, it is an underlying factor in high food prices, as it raises the cost of both inputs and imported food products. Substantial differences in price levels between surplus and deficit regions suggest that investments able to reduce the cost of transportation would hold significant benefits to producers and consumers alike." This chapter mentions issues like investing in agricultural research and development as well, but the main priorities emphasized are these issues of infrastructure, property rights, and production chains. The enormous population boom coming in sub-Saharan Africa in the next several decades is one of those unseen demographic earthquakes that is going to shake up the world economy in all kinds of ways. For example, there will be enormous economic pressures for migration to the relatively nearby countries of the European Union. The evolution of Africa's agriculture sector will play a major role in shaping the characteristics and consequences of its population boom. The economics of exchange rates can be tough sledding. 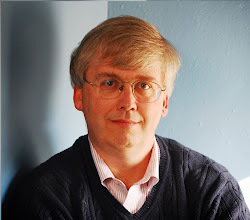 Every now and then, I post on the bulletin board beside my office a quotation from Kenneth Kasa back in 1995: "If you asked a random sample of economists to name the three most difficult questions confronting mankind, the answers would probably be: (1) What is the meaning of life? (2) What is the relationship between quantum mechanics and general relativity? and (3) What's going on in the foreign exchange market. (Not necessarily in that order)." In any given year, a sizable chunk of investment goes to replacing what wore out or became obsolete in the previous year. Thus, the Bureau of Economic Analysis calculates both gross investment, which is the total invested, and net investment, which is what is actually added to the capital stock after accounting for investment that only offset the depreciation of the older capital. 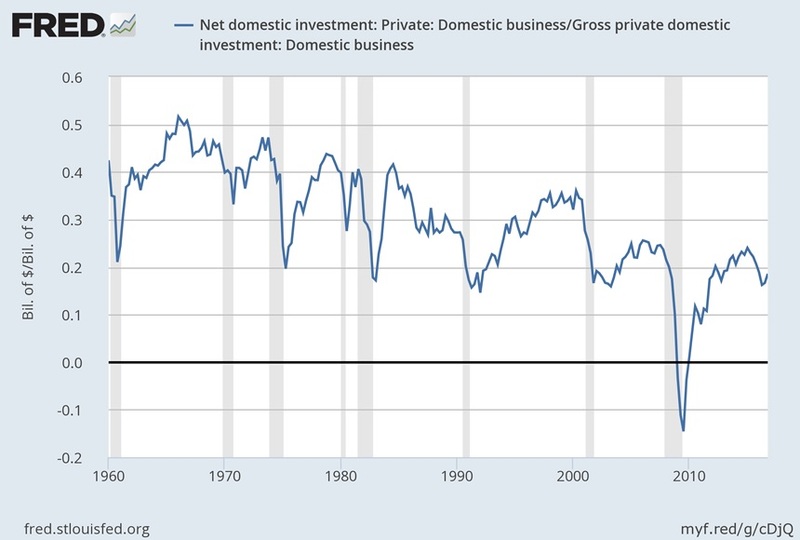 Both gross and net investment by private business have been declining in the US economy--but net investment is declining faster. Consider some a couple of figures. 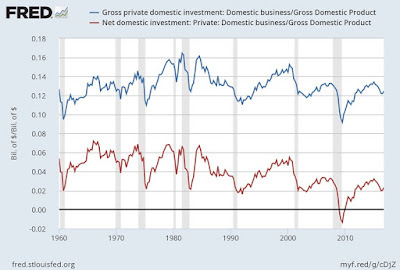 This blue line on the graph shows gross investment by private domestic firms, while the red line shows net investment by private firms, both divided by GDP. 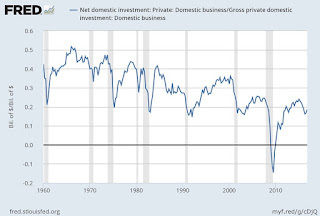 You can see that from the 1970s and up into the 1990s, high levels of gross investment exceeded 14% of GDP. But since 2000, high levels of gross investment don't reach 14% of GDP. 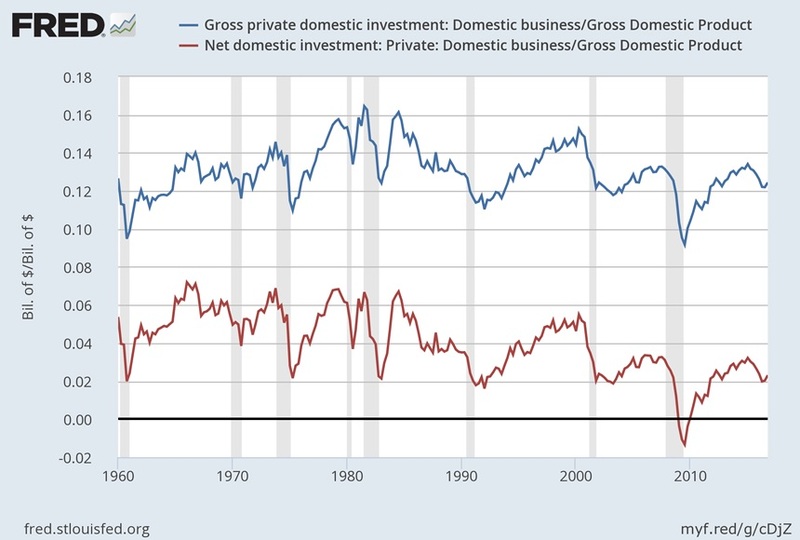 Interestingly, the drop-off in investment seems more visible in the red line showing net investment. In the next figure, net domestic investment by private domestic firms is divided by gross investment: in effect, this calculation shows what percentage of total investment is actually adding to the capital stock, rather than just replacing earlier investments that have depreciated. The striking pattern is that from the 1960s up to the early 1980s, it was common for about 40% or more of total investment to be "net" or new investment. But since about 2000, it's been common for about 20% of total investment to be "net" or new investment, while the other 80% is replacing older capital stock. 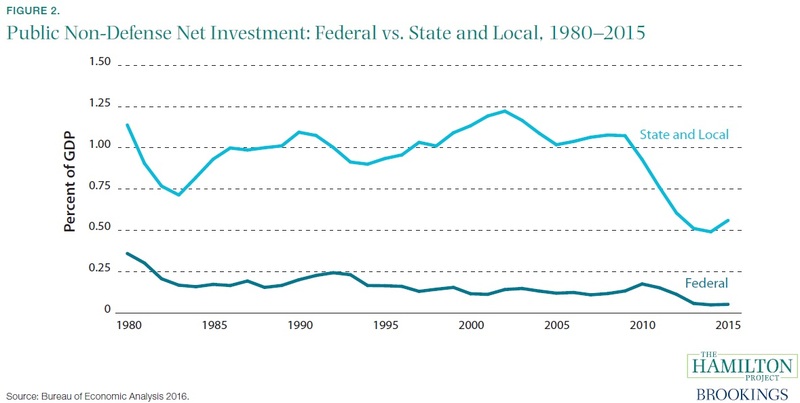 The decline in net investment also shows up in government infrastructure investment, especially in the years since the Great Recession. 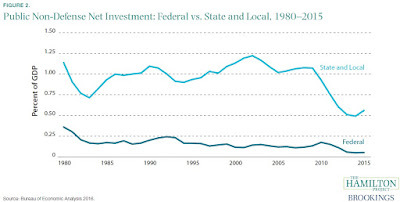 Here's a figure from "If You Build It: A Guide to the Economicsof Infrastructure Investment," a useful overview of issues related to infrastructure spending by Diane Whitmore Schanzenbach, Ryan Nunn, and Greg Nantz (Hamilton Project, February 2017). The decline in investment is bothersome in a number of ways. Investment in physical capital is one of the factors that over time raises productivity and wages. It's a little troublesome that 80% of gross investment is going to replace old capital, rather than add to the capital stock. And low investment is at the root of concerns about the possibility of "secular stagnation," which is a worry that the economy is headed for a slow-growth future because investment spending is likely to remain low. India has more than 1.2 billion people, and it is has been growing rapidly and carrying out substantial policy changes, but it seems to get only a small fraction of the attention paid to China. For those looking to get up to speed on India's economy, a useful starting point is the Economic Survey 2016-2017, published in January 2017 by India's Ministry of Finance (where Arvind Subramanian is the Chief Economic Adviser). The page also has a drop-down menu with links to previous annual surveys. remarked how it has many more axes of cleavage than other countries: language and scripts, religion, region, caste, gender, and class ..." Here are seven points from the report that stuck with me. 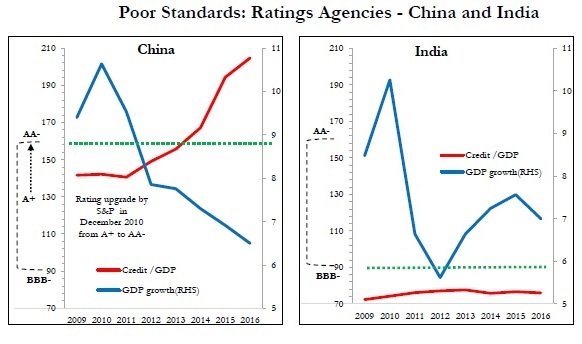 1) In recent years, India's rate of economic growth is faster than China, and India has not been taking on the extraordinary debt load of China. 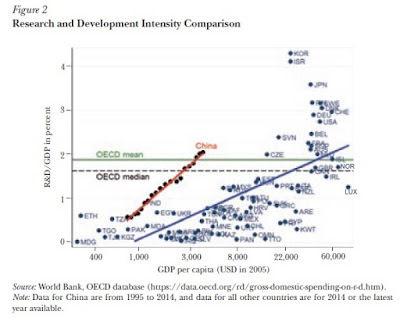 The left-hand panel shows GDP growth (blue line) and debt/GDP level (red line) for China. The right-hand panel shows the same patterns for India. 2) India has become quite open to foreign trade,but also to internal trade across regions of India. 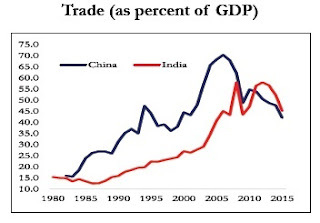 For example, here's a figure comparing China and India on trade as a share of GDP. And here's a figure showing where the horizontal axis shows the size of a country's population (measured in logs) and the vertical axis shows trade/GDP. 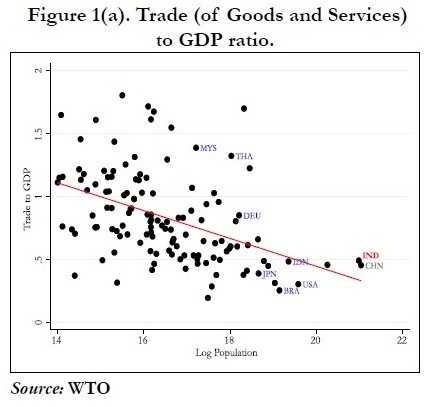 Countries with more people tend to have relatively more internal trade, and thus their ratio of external trade/GDP is lower. 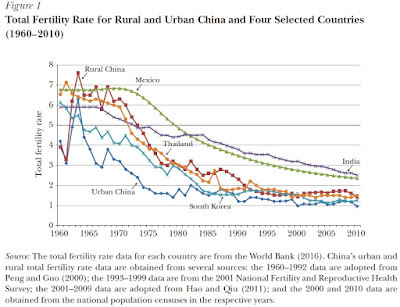 China and India are both out at the far right as large-population countries. 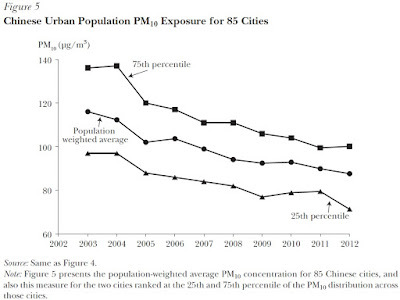 Both are above the best-fit line, which means that their level of external trade is higher than the usual pattern, given their population levels. 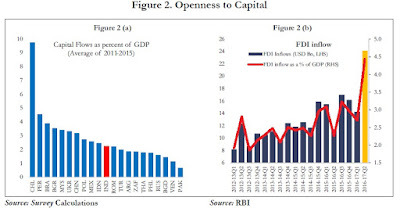 3) India has become fairly open to inflows of foreign capital. 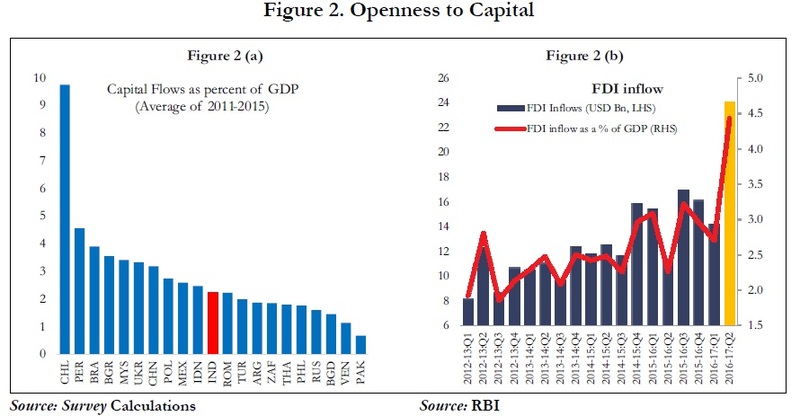 The left-hand panel shows capital flows as a share of GDP over five years, in which India is pretty similar to Indonesia, Mexico, and China. The right-hand panel shows patterns just for India of inflow of foreign direct investment, which have been rising as a share of GDP. 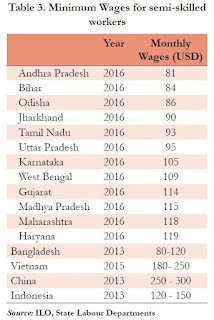 4) In many Indians states, wages for semi-skilled workers are low by world standards. 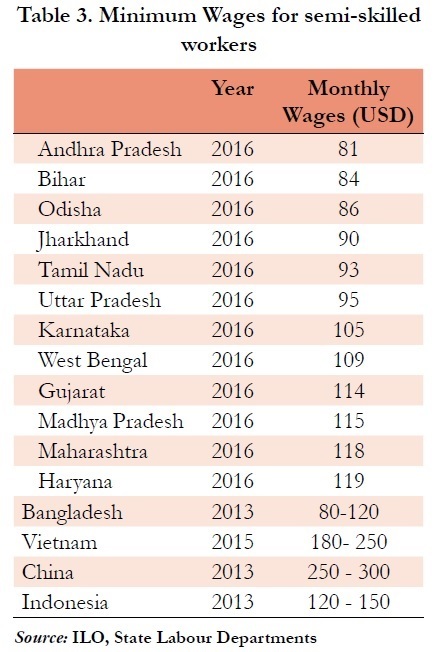 The report discusses the possibility that India could latch on to a substantial share of low-wage manufacturing in areas like apparel and shoes. 5) India has has more success than many low-income countries in participating in international trade in services, but with the tides seemingly running against globalization, there is some question about whether this will continue. "If India grows rapidly on the back of dynamic services exports, the world’s service exports-GDP ratio will increase by 0.5 percentage points—which would be a considerable proportion of global exports. Put differently, India’s services exports growth will test the world’s globalisation carrying capacity in services. Responses could take not just the form of restrictions on labor mobility but also restrictions in advanced countries on outsourcing. 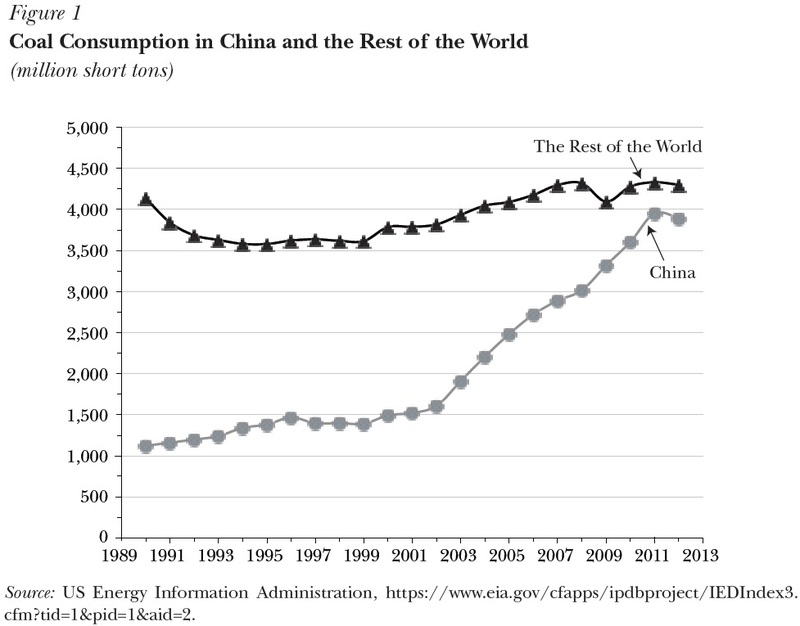 "It is possible that the world’s carrying capacity will actually be much greater for India’s services than it was for China’s goods. 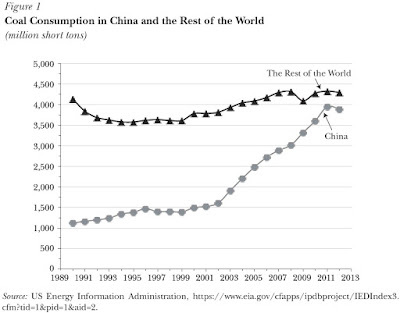 After all, China’s export expansion over the past two decades was imbalanced in several ways: the country exported far more than it imported; it exported manufactured goods to advanced countries, displacing production there, but imported goods (raw materials) from developing countries; and when it did import from advanced economies, it often imported services rather than goods. 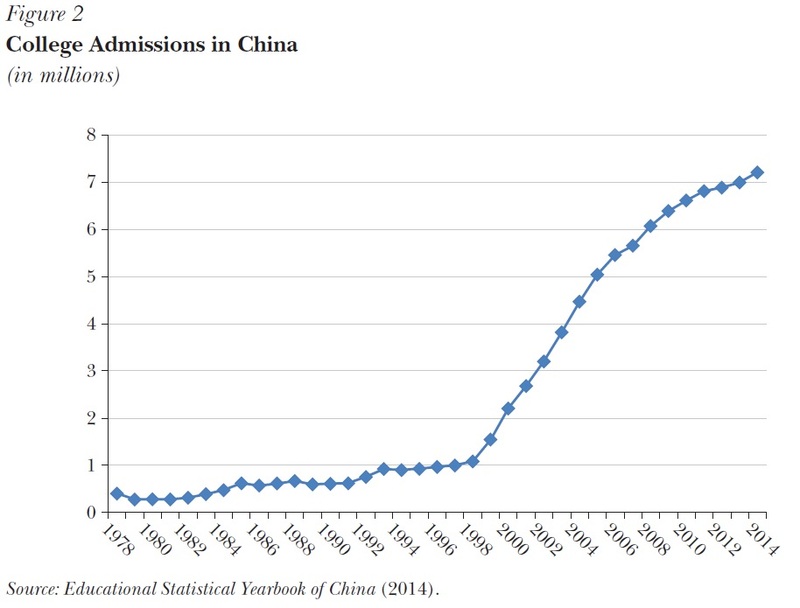 As a result, China’s development created relatively few export-oriented jobs in advanced countries, insufficient to compensate for the jobs lost in manufacturing – and where it did create jobs, these were in advanced services (such as finance), which were not possible for displaced manufacturing workers to obtain. 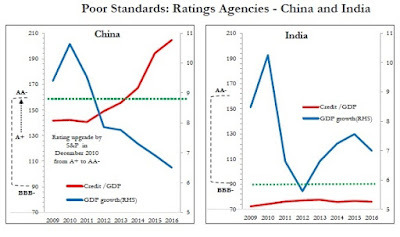 "In contrast, India’s expansion may well prove much more balanced. India has tended to run a current account deficit, rather than a surplus; and while its service exports might also displace workers in advanced countries, their skill set will make relocation to other service activities easier; indeed, they may well simply move on to complementary tasks, such as more advanced computer programming in the IT sector itself. On the other hand, since skilled labour in advanced economies will be exposed to Indian competition, their ability to mobilize political opinion might also be greater." 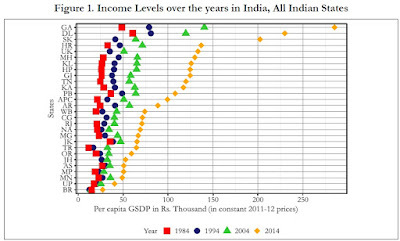 6) India is experiencing a sharp divergence and widening gaps in income and consumption across the states of India. 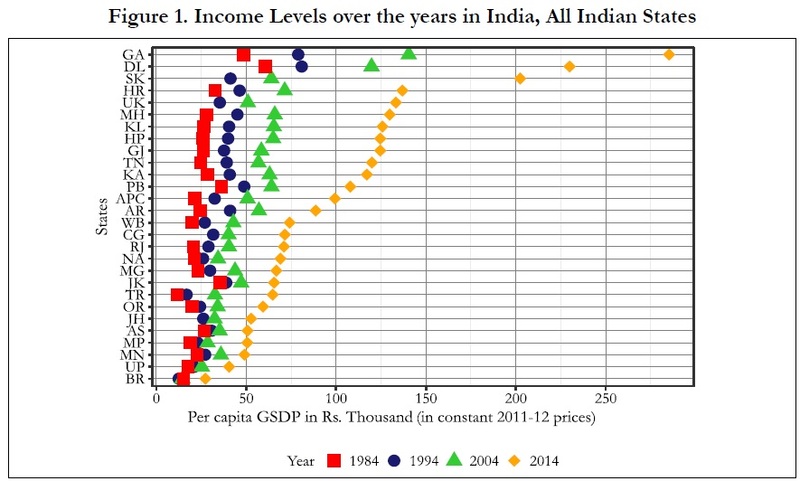 Here's a figure showing per capita GDP, with each row showing a state of India. The red squares show the levels in 1984; the blue circles, in 1994; the green triangles, 2004; the yellow diamonds, 2014. The spread across regions is clearly widening. The figure reminds me of an old line about the economy of India, describing it as "part southern California, part sub-Saharan Africa." 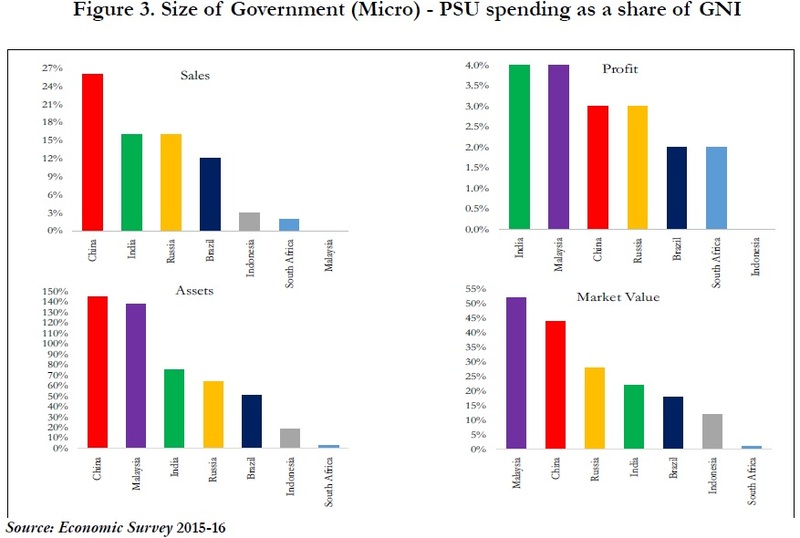 7) India's economy is mostly driven by the private sector, but surveys in India reveal a high level of ambivalence about the public sector. 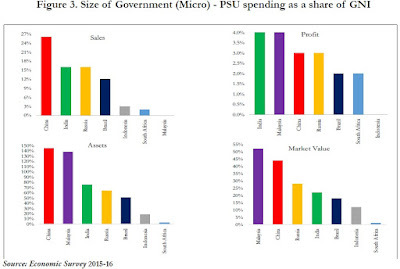 The green bars show production from state-owned enterprises in India--known there as "public sector undertakings" or PSUs--as measured by share of sales, profits, assets, and market value. The red bars show the same measures for China; yellow bars, Russia; dark blue bars, Brazil; gray bars, Indonesia; light blue bars, South Africa; purple bars, Malaysia. All of these countries show what would be a large level of state-owned enterprises by the standards of high-income countries, but India does not especially stand out. . However, India does stand out in how its citizens feel about the private sector. This graph shows the results from a group of questions about the private sector on the World Values Survey. The level of pro-market sentiment in India is comparable to Argentina and Russia. There is much more in the report. For example, a number of chapters are focused on specific policy changes and proposals. One chapter discusses the "demonetisation," in which India recently took its two largest-denomination notes out of circulation, abruptly and without warning, as a way of fighting corruption, crime, and the underground economy. Another chapter discusses the possibility of a large public agency to take on the legacy of bad debt, and clear the balance sheets for large companies and banks, so that they can focus on looking ahead rather than on cleaning up past problems. Yet another chapter discusses the idea of a universal basic income in India. "The central government alone runs about 950 central sector and centrally sponsored sub-schemes which cost about 5 percent of GDP." But these programs impose considerable bureaucratic cost and fail to assist many of the actually poor. 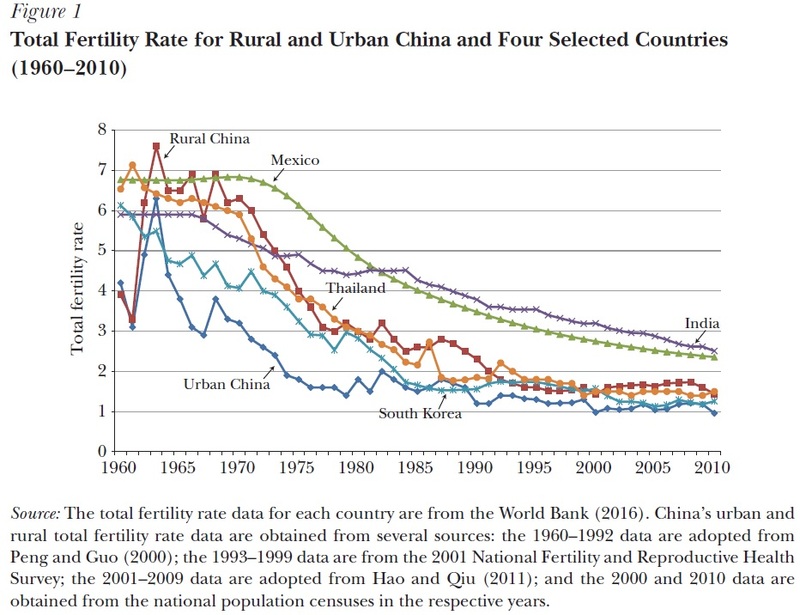 Homage: I ran across a mention of this report in a post by Alex Tabarrok at the always-interesting Marginal Revolution website, which focuses on a chapter of the report discussing how a number of India's governmental redistribution programs are ineffective and even counterproductive. 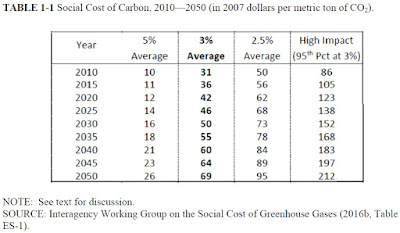 The social cost of carbon (SC-CO2) for a given year is an estimate, in dollars, of the present discounted value of the future damage caused by a 1-metric ton increase in carbon dioxide (CO2) emissions into the atmosphere in that year or, equivalently, the benefits of reducing CO2 emissions by the same amount in that year. The SC-CO2 is intended to provide a comprehensive measure of the net damages—that is, the monetized value of the net impacts—from global climate change that result from an additional ton of CO2. Those damages include, but are not limited to, changes in net agricultural productivity, energy use, human health, property damage from increased flood risk, as well as nonmarket damages, such as the services that natural ecosystems provide to society. Many of these damages from CO2 emissions today will affect economic outcomes throughout the next several centuries. The IWG’s current estimate of the SC-CO2 in the year 2020 for a 3.0 percent discount rate is $42 per metric ton of CO2 emissions in 2007 U.S. dollars. If, for example, a particular regulation was projected to reduce CO2 emissions by 1 million metric tons in 2020, the estimate of the value of its CO2 emissions benefits in 2020 for this SC-CO2 would be $42 million dollars. It's worth unpacking that number just a bit. Here's an illustrative table giving a sense of the range of estimates under various conditions. The social cost of carbon is based on a range of computer simulations. There are several different "integrated assessment models," in which which a "CO2 emissions pulse is introduced in a particular year, creating a trajectory of CO2 concentrations, temperature change, sea level rise, and climate damages." Another key parameter the "equilibrium climate sensitivity," which represents a distribution of the effect that carbon emissions could have on climate in the future. 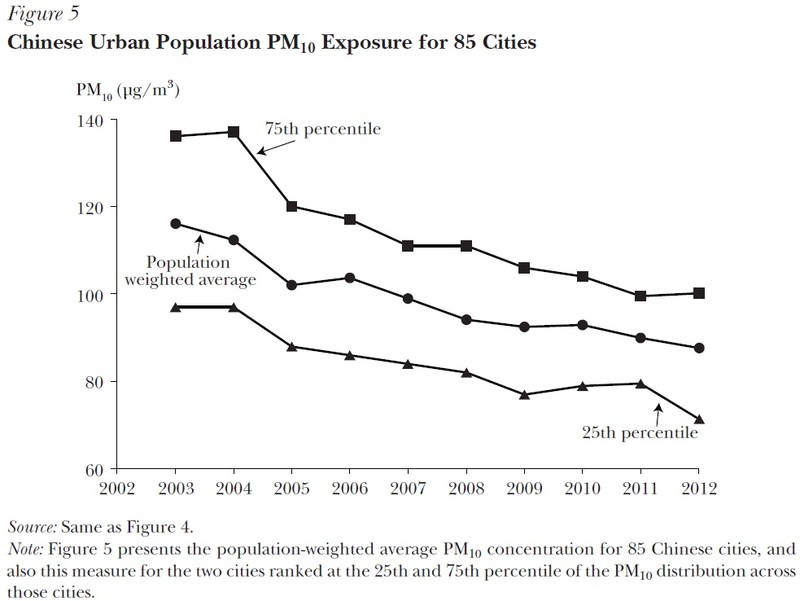 There are also various scenarios for how emissions and various socioeconomic variables will evolve. The approach of the Interagency Working Group is to run a bunch of computer simulations with different combinations of these variables and different random draws of the "equilibrium climate sensitivity" parameter from its overall distribution, thus giving them a sense of how these different underlying assumptions can interact with each other. The rows of the table show different years. 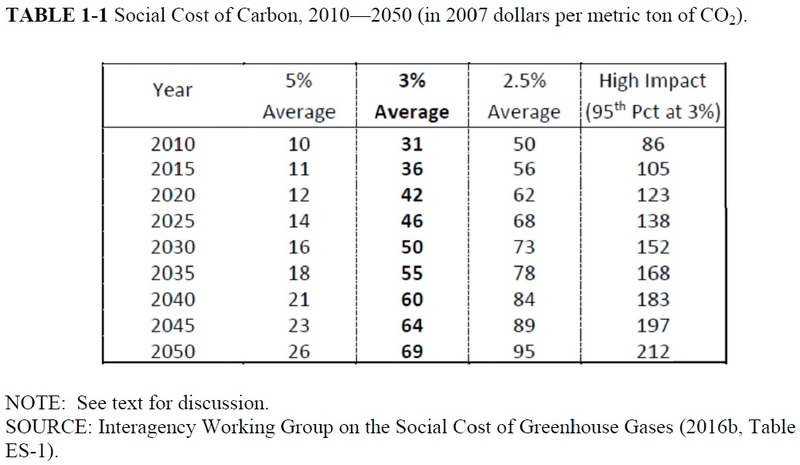 The social cost of carbon rises over time, as the levels in the atmosphere rise and the costs become greater. The columns show different assumptions about what economists call the "discount rate." Most analysts accept the idea that if we are thinking about spending a fixed amount of current resources, it makes more sense to spend the money reducing a current harm than a future harm. To put the point more bluntly, taking an action to save 500 lives right now is more valuable in the present than taking an action to save 500 lives a century from now. Exactly how much more valuable are current benefits than future benefits? As you might imagine, the answer to that question is controversial, and so standard practice is to offer a range of estimates. A commonly used discount rate is 3%, which implies that each year a benefit is further off in the future, it's worth 3% less. A higher discount rate thus puts a lower weight on future benefits; a zero discount rate would mean that a benefit receives at any time in the future, no matter how far into the future, would be just as valuable as a benefit received right now. The social cost of carbon calculation matters for public policy, because it's the value that is currently used by government rules and regulations when taking carbon costs into account. For perspective, the federal gasoline tax is currently 18.4 cents/gallon, and when state and local gas taxes (which vary across jurisdictions) are added to the mixture, total gasoline taxes are now about 49 cents/gallon. The usual rationale for such taxes is that they are a "user tax" so that those who drive also pay for updating and maintaining the roads. If the government set a carbon tax so that those who are emitting carbon through burning gasoline would would pay the cost of their emissions, a carbon tax of $42/ton of carbon emissions would work out to a gasoline tax of about 38 cents/gallon.